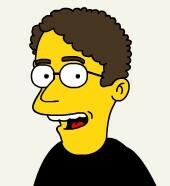 fanpop Simpsonized - Papa. I don't know if anda consider these flattering, but... if anda guys ever get to appear on the Simpsons they can use these. :). Images in the fanpop club tagged: fanpop simpsons logos papa. LMAO, I can never get over that curly hair!